Robustdetails were developed as the alternative to the need for compulsory sound insulation testing. The scheme established a set of construction specifications and details that consistently delivered compliance with the Building Regulations. Since 2004 Robustdetails have succeeded in delivering at least 97% compliance with the Building Regulations whist ensuring that over £17m that would have been spent on testing fees was spent improving the quality of housing acoustics. The scheme is also preventing regular handover delays and remedial costs. Each Robustdetail provides a wall or floor design specification with associated details of how the wall or floor should junction with external or internal walls or floors. The details are designed to consistently exceed the building regulation requirements even allowing for variances in workmanship. The details include checklists for workmanship to allow the contractor to check that the walls, floors and materials being adopted are correct and built in the required format. These are mainly applicable to all linked dwellings. Further details are available on Robustdetails website. If you are a client (other than a domestic client) for a construction project, the Construction (Design and Management) Regulations 1994 – CDM for short – will probably apply. The purpose of CDM is to ensure that health and safety is co-ordinated and managed throughout all stages of a construction project in order to help reduce accidents, ill-health and costs. Where CDM applies, you will have legal duties to discharge (which are enforceable in a court of law). Your duties are the same whatever the size of project. However, how much you will actually need to do will vary from project to project. Where any potential risks are low, little will be required of clients. Where they are higher, you will need to do more. It is important that what you do is proportionate to the risks and does not create any unnecessary paperwork. NB: A domestic client is someone who lives, or will live, in the premises where the work is carried out. The premises must not relate to any trade, business or other undertaking. So an individual building his/her own dwelling to live in it will not be required to notify the HSE. Depending on the package purchased, we will include our design risk assessments for the properties, as required by the Construction (Design and Management) Regulations 1994, for you to include within your Health & Safety File. The Standard Assessment Procedure (SAP) for energy rating of dwellings is a calculation of a building’s energy efficiency. SAP ratings are scored on a scale from 1 to 120 where 1 is the worst and 120 the best. The Carbon Index is a measure of the domestic energy efficiency linked to the carbon emissions from a property. It is based on the annual CO2 emission figure calculated in relation to the floor area. The Index is expressed on a scale of 0 to 10, with a higher number representing higher average energy efficiency. A dwelling may demonstrate compliance if the Carbon Index achieves a score of 8 or above. 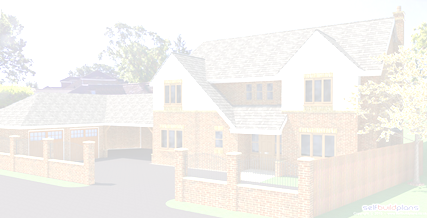 An Energy Performance Certificate and new homes. From 6 April 2008 it will be law to provide an Energy Performance Certificate for all new and newly built homes that are completed after that date. 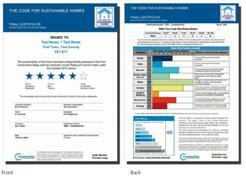 An Energy Performance Certificate (EPC) gives information on the building’s energy efficiency. By law, Energy Performance Certificates can only be produced by an accredited On Construction Energy Assessor. * People who are currently doing SAP calculations to show that they meet Target Emission Rates as part of Building Regulations will need to join an accreditation scheme before they can produce EPCs. The Code for Sustainable Homes (the Code) is an environmental assessment method for rating and certifying the performance of new homes. It is a national standard for use in the design and construction of new homes with a view to encouraging continuous improvement in sustainable home building. It was launched in December 2006 with the publication of Code for Sustainable Homes: A step-change in sustainable home building practice (Communities and Local Government, 2006) and became operational in April 2007. Where Building Regulations apply, compliance is necessary at all times. Each category includes a number of environmental issues. The Code uses a sustainability rating system – indicated by ‘stars’, to communicate the overall sustainability performance of a home. A home can achieve a sustainability rating from one (*) to six (******) stars depending on the extent to which it has achieved Code standards. One star (*) is the entry level – above the level of the Building Regulations; and six stars (******) is the highest level – reflecting exemplar development in sustainability terms. The Code sets minimum standards for energy and water use at each level and, within England, replaces the EcoHomes scheme, developed by the Building Research Establishment (BRE).